Saturnalia Productions rents the Canon 86x9.3mm HD lens. Our office is located in Los Angeles, California, but we ship HD lenses and cameras around the world. The Canon 86x9.3 lens is ideally suited for events that require, due to the venue and/or camera location, a telephoto high definition lens. Sporting events and concerts are two venues which are particularly suited to rental and use of the Canon 86x7.3mm HD zoom lens. Saturnalia Productions often uses this lens as part of our fiber back Sony HDW F900 and Panasonic HDX900 multi-camera productions, which have included over 100 concerts on nearly every continent. We have some of the most experienced video engineers and technical producers of multi-cam, fiber back events in the world. Simply contact us to discuss the details of your event and we can send you a bid. 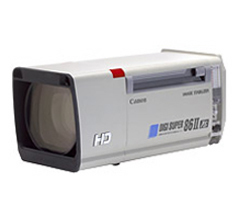 Our services are a la carte, so you may simply rent the Canon 86x9.3mm high definition lens if you wish.